This week at DB Sports Tours we’re delighted to tell our readers about the development of one of our players, Darragh Leahy. 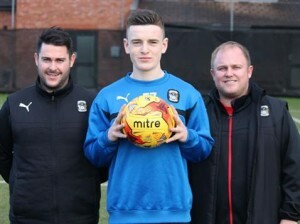 Leahy (17) was captain for Coventry City’s FA Youth Cup match on Monday night, in which they narrowly lost on penalties to the illustrious Arsenal at the Ricoh Arena. Having been captain in what is the pinnacle of youth football, Leahy’s side took Arsenal to the brink, and were desperately unlucky to have lost on penalties following a swashbuckling 120 minutes which ended 2-2. The game saw Leahy’s side take the lead, but were pegged back in the second half. The game actually ended 1-1 after 90 minutes, but extra-time saw the action continue. The Gunners went ahead in the first minute of the second-half of extra time, but in dramatic fashion Leahy’s side found the equaliser late into the final moments of extra-time, which saw them take the Gunners to penalties, in which they unluckily lost after 18 spot kicks. Leahy signed for Coventry City in 2015 on a two-year deal, following a spell at the unmistakeable St. Kevin’s Boy’s, from Whitehall, Dublin. Leahy has been a fixture in the Ireland youth set-up, notably gaining a cap in key European qualifier against Gibraltar, alongside other DB Sports Tours stars. Having since joined Coventry Leahy has caught the eye of many in their youth set-up, with the local media doing a special feature on the defender. Leahy was a part of the St Kevin’s Boys Club under-15 side won their fourth consecutive All-Ireland title last season – a unique achievement in Irish junior football. The North Dublin club also secured an impressive treble, picking up their third title in a row which attracted attention with some of his team-mates making their way to England already. When Leahy joined Coventry City last year David Berber of DB Sports Tours spoke enthusiastically about his first sighting of the starlet. Below is a clip of the dramatic equaliser from Monday night’s game.